Meeting will have little impact on the practical issues, as the President of Israel is mostly a symbolic figure, but it will take place while attempts get underway in Washington for direct negotiations between Israel and the Palestinians. The quest for agreements between Israel and the Holy See advance. 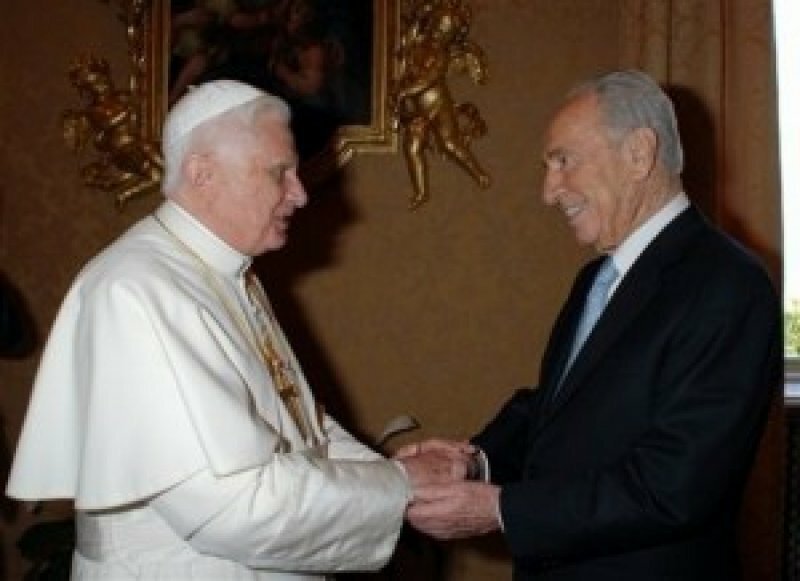 It is difficult to foresee that the visit of Peres to the Pope will have any specific effect on practical details of these relations, which in substance are being dealt with through other channels. The President, in Israel, is an almost exclusively symbolic figure, while the executive power is exercised by the Government. More probably, President Peres’s travels are in the context of the task he has for a while now assigned himself of cultivating Israel’s international image, given wide-spread skepticism concerning the intentions of the Government headed by Prime Minister Benjamin Netanyahu. The Prime Minister himself will on that day be in Washington, for the start of the peace negotiations between Israel and the Palestine Liberation Organisation (PLO), chaired by Mahmoud Abbas, “Abu Mazen” – negotiations convened by President Barack Obama of the United States. As for the bilateral relations with the Catholic Church (or as is improperly said in the televised interview, “the Vatican”), these are now at a phase of special importance. Since 29 July 1992, the Holy See and Israel are committed to concluding a series of “concordat-type” treaties, which together are meant to achieve legal and fiscal security for the Catholic Church in Israel. Two of those treaties were already signed and ratified some years ago: The “Fundamental Agreement” (30 December 1993), a kind of “Bill of Rights” for the Church in the Jewish State, and the “Legal Personality Agreement” (10 November 1997), which recognizes for civil purposes too the legal personality of the Church and of Church bodies. However, neither of these treaties has been introduced into Israel’s own legislation, which means that their usefulness is at present limited. Since 11 March 1999, the Parties have been negotiating a third Agreement, for the purpose of confirming the fiscal status of the Church in Israel, especially the historic fiscal exemptions, which are an essential requirement for the ability of the Church to continue to carry out her functions of representing in the Holy Land the world-wide Church and of caring for the faithful locally. This third Agreement will also have to safeguard the Church’s properties in Israel, the Holy Places above all, and to provide for the restitution of certain such properties, such as for example the church-shrine in Caesarea, which was expropriated and razed to the ground in the 1950’s. The next “plenary” meeting of the negotiators – who together constitute the “Bilateral Permanent Working Commission between the Holy See and the State of Israel” - is scheduled for 6 December this year. In the meanwhile, well informed sources say, the negotiators are working intensively. The United States, France, Italy and other nations are closely (though discreetly) following the course of the negotiations, consistently with their support – and that of their Catholic citizens – for the presence and work of the Church in the Holy Land. Once this Agreement is made (and it is impossible to foresee when this may be), or even before then and parallel to the talks about it, the “agenda” foresees several more Agreements of no lesser importance. In the course of the years, three subjects in particular have been publicly emphasized. First of all, an agreement that would guarantee and regulate in a stable manner the issuance of entry visas and residence permits for Church personnel from elsewhere. Here the State’s policies have varied over time, though their overall direction has been rather restrictive. More than anything else, it is the lack of legal certainty that is problematic, namely the lack of officially published criteria. Then there is this subject that is of the greatest pastoral concern, norms to guarantee the access to pastoral care of members of the faithful who find themselves in circumstances of limited mobility, specifically prisoners, members of the military and hospital patients. The accord on these matters between the Government of Italy and the Union of the Jewish Communities in Italy is often mentioned as a model, given the analogy between the small Jewish minority in Italy and the small Christian minority in Israel. The third subject often publicly mentioned in these years is a review of the presentation of Christ, Christianity and the Church in Israel’s school system. It would serve to verify effective reciprocity in relation to the immense undertaking by the Catholic Church over recent decades to ensure a correct, indeed a friendly, presentation of Judaism and the Jews in Catholic education. There is then still some way to go in order for the “dialogue” mentioned by President Peres to achieve its purposes completely. However, the forward-looking optimism of the President of Israel is promising, and in fact it seems that both Parties are working towards that goal and are making steady progress.